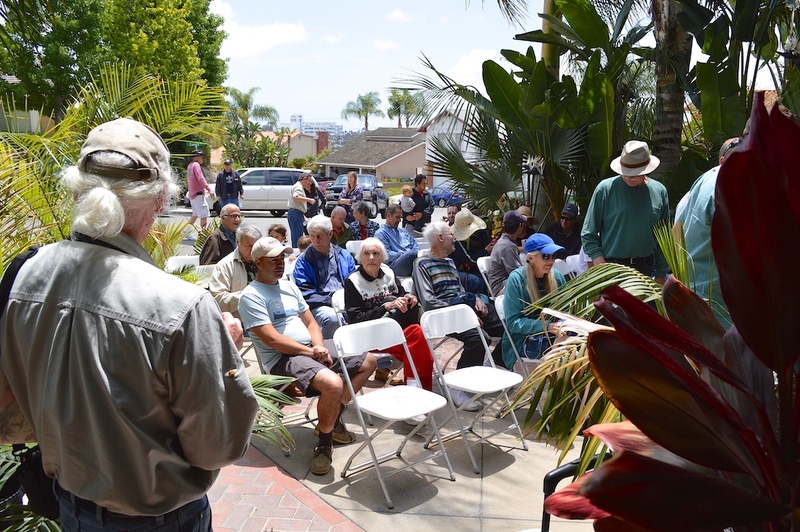 This past Saturday the Palm Society of Southern California (PSSC) held their quarterly meeting . 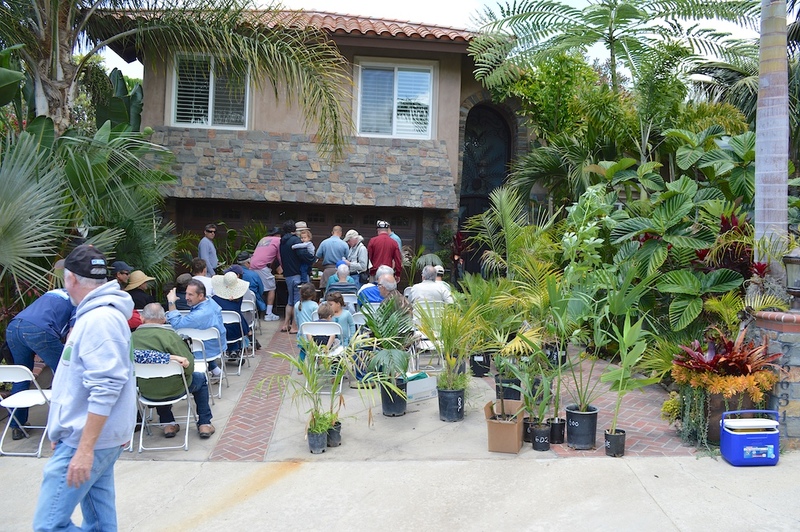 This May meeting included two wonderful gardens tours in the Mission Viejo area. While I have been a member of the PSSC for many years now, I am usually unable to attend these meetings, as something kid-related always seems to take up my calendar. Lucky for me this past weekend was open, as I was really looking forward to touring these two vastly different palm tree gardens. The first of the two stops was the Jim Vargin garden. Jim lives on a 10,000 sq. 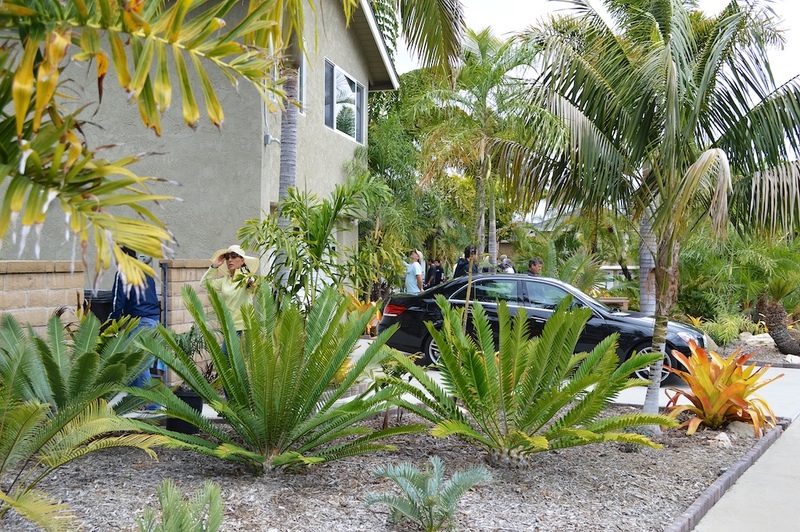 ft. lot that he began landscaping just over twelve year ago. 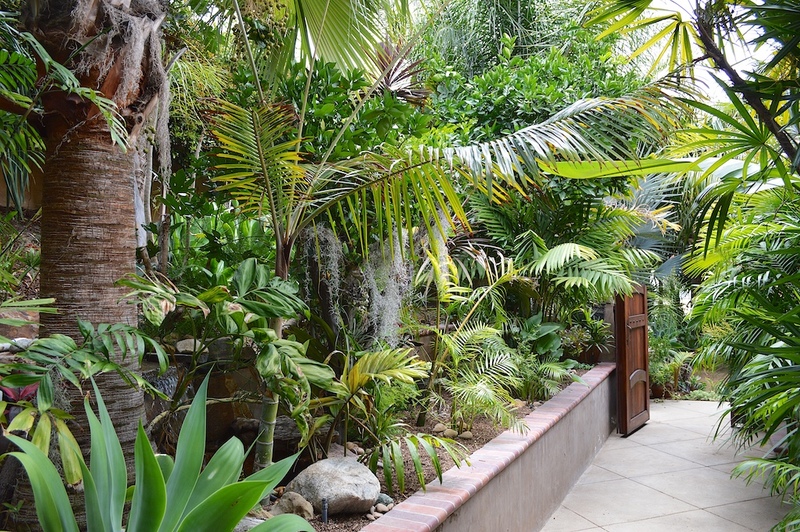 Within that twelve-year period Jim has managed to plant over 120 palm species and 50 cycad species to his yard. 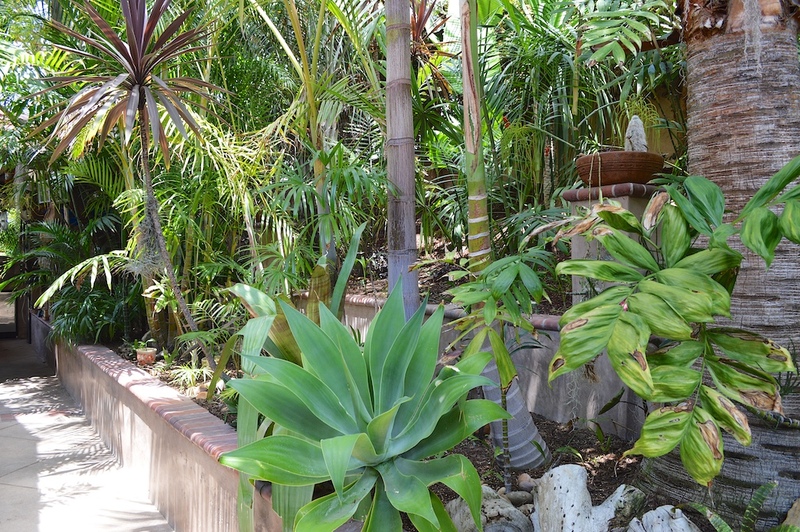 His garden is more open than your typical palm lover’s garden; and that was a welcome relief. 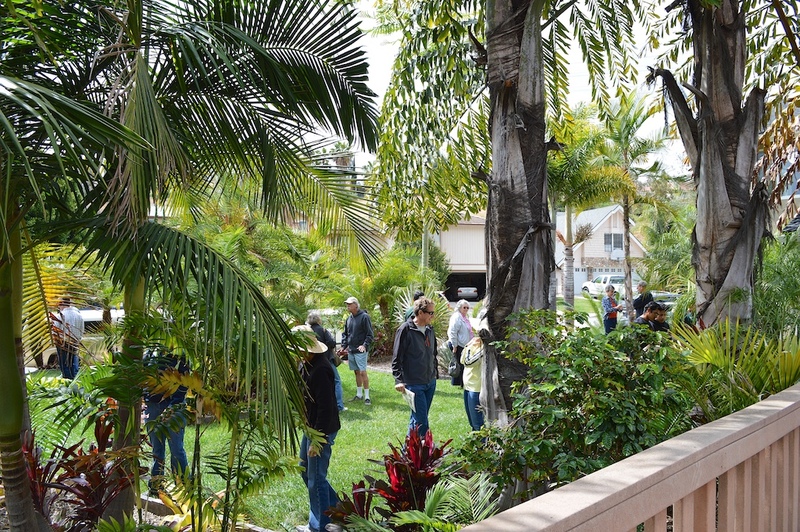 One of the joys of visiting the different gardens of Palm Society members is the chance to see the varying landscape styles they have. 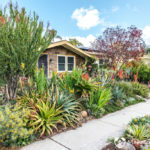 When you talk about palmy landscapes, not many have negative space built into the garden, which affords you the opportunity to stand back from a distance and enjoy the plants like you can at Jim’s garden. 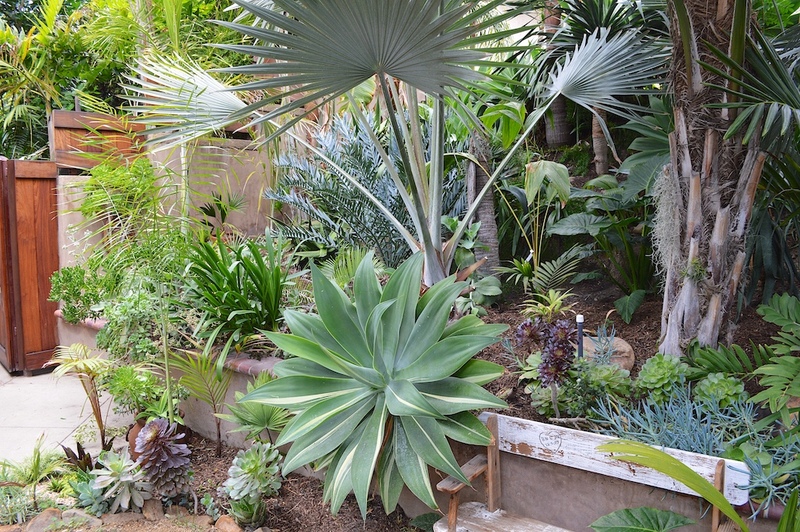 Still in the front yard we see from left to right a Syagrus botryophora, Wodyetia bifurcata and a Caryota obtusa towering over the garden. 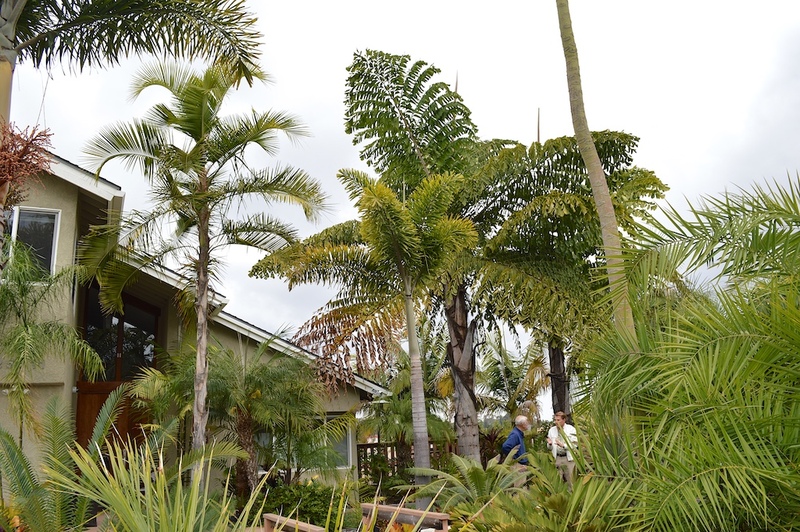 When Jim moved into the house he had to remove over 60 trees to make room for his new palm and cycad garden. 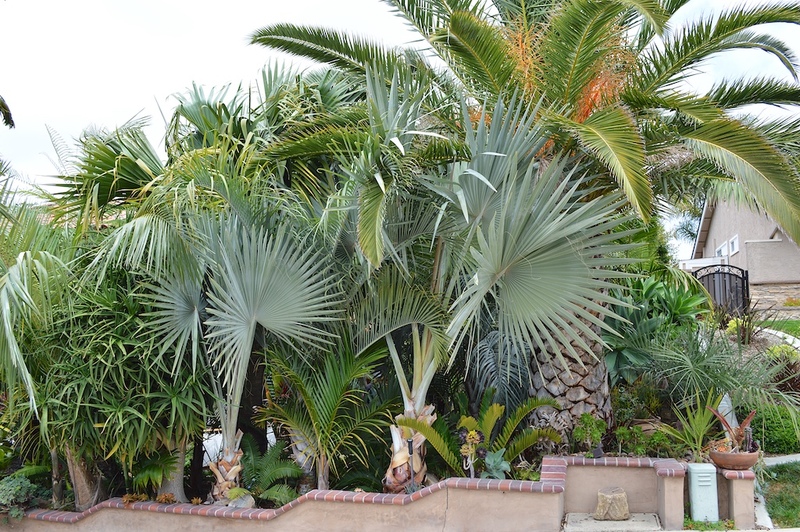 Jim craned in this 50-year-old Chamaerops humilis when he first started landscaping his new yard. 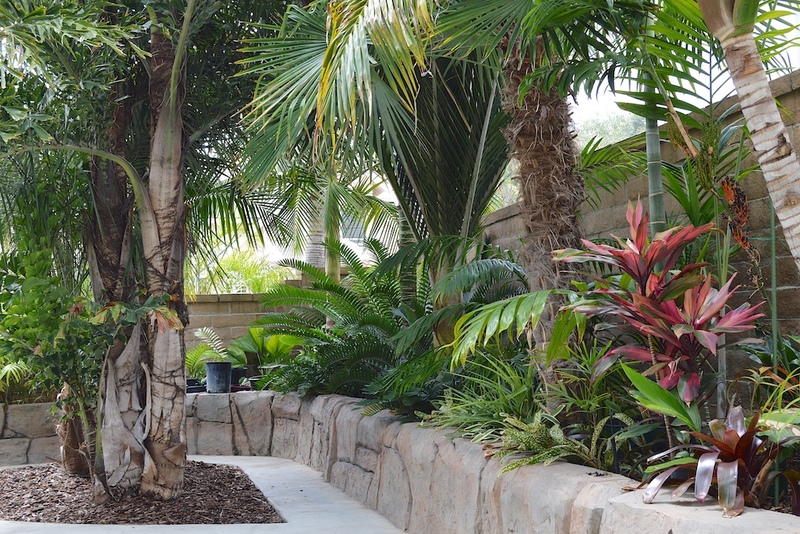 The side yard showing a different way to build a retaining wall. Jim’s backyard was mostly used for his pool and a large deck. While there was not a lot of room to plant anything in the small backyard, the deck did provide for good vantage points to look out over the front yard and side terraced part of his garden. 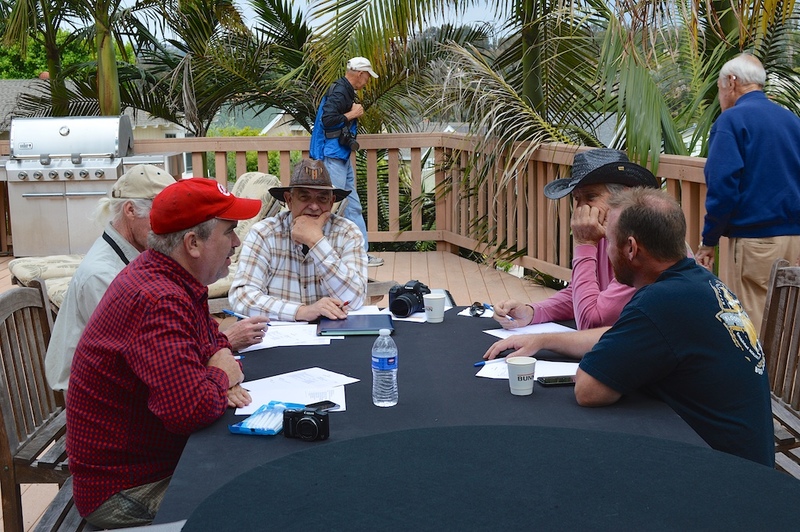 The deck also served as the Palm Society of Southern California’s Board of Directors meeting location. 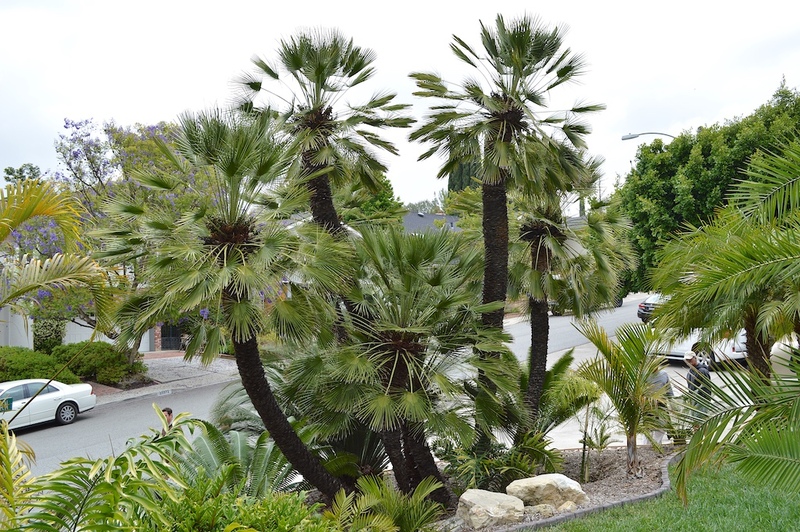 They won’t win any fashion shows but they sure know a lot about palm trees. The last photo of Jim’s yard shows the view looking down his terraced hillside. 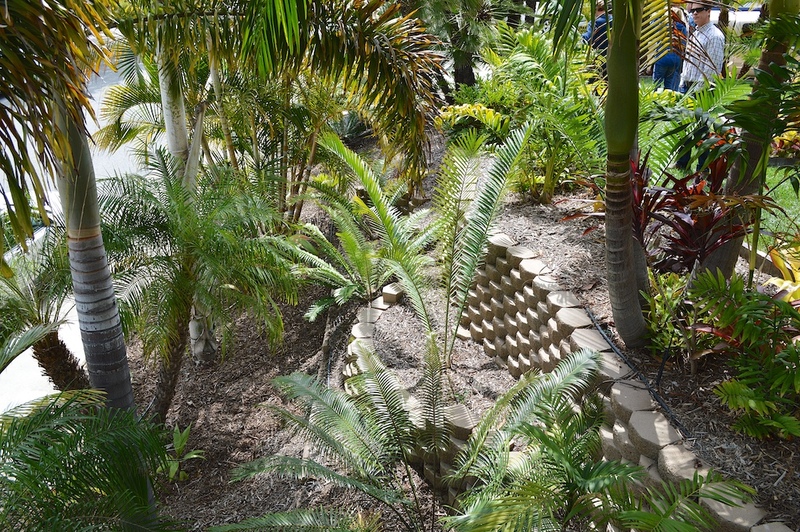 Before leaving for the next garden we had the opportunity to see in person Keven Weaver’s ice cream truck, but for palms and cycads of course. 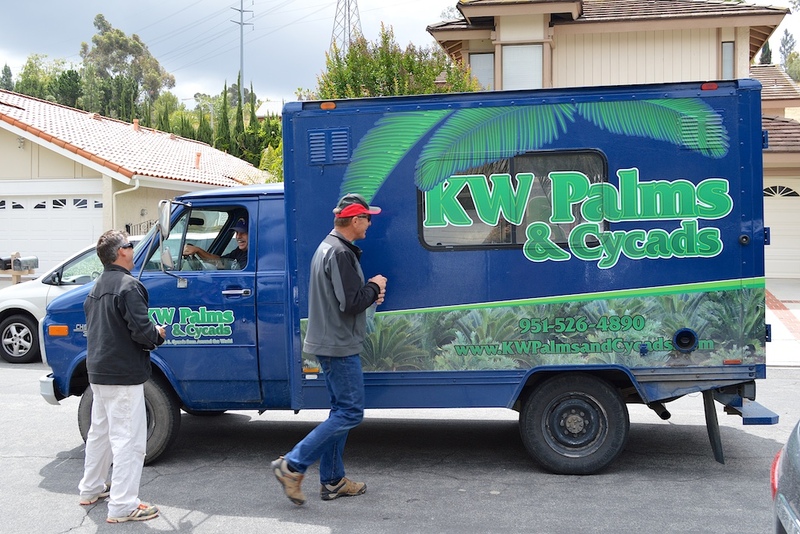 KW Palms and Cycads donates a lot of plants to the plant auction that happens at the end of the day and is documented later in the post. 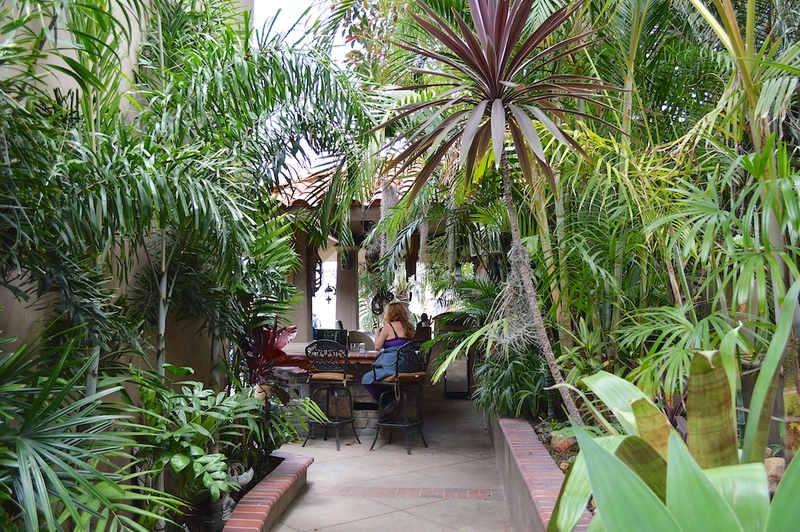 The second garden in the tour was that of Jawad and Brooke Nesheiwat. 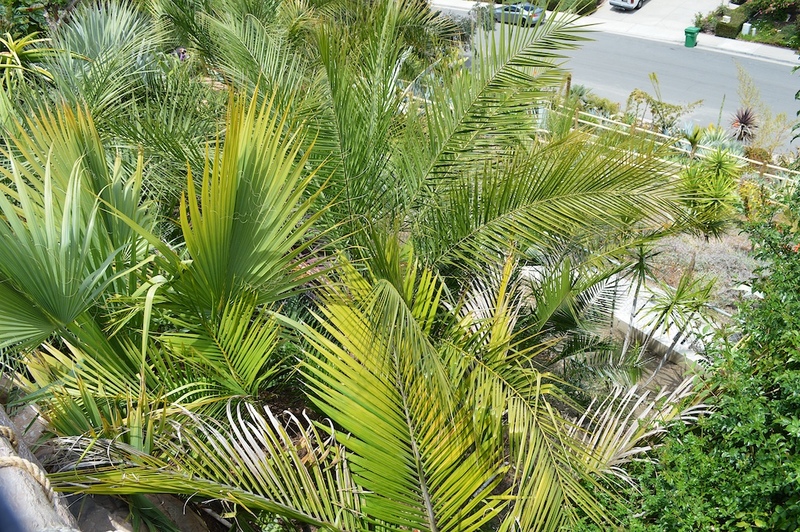 The Nesheiwat’s found their love of palm trees in 2007 and have been planting ever since. 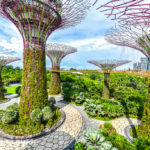 They have created a dense, lush landscape in a very short amount of time. 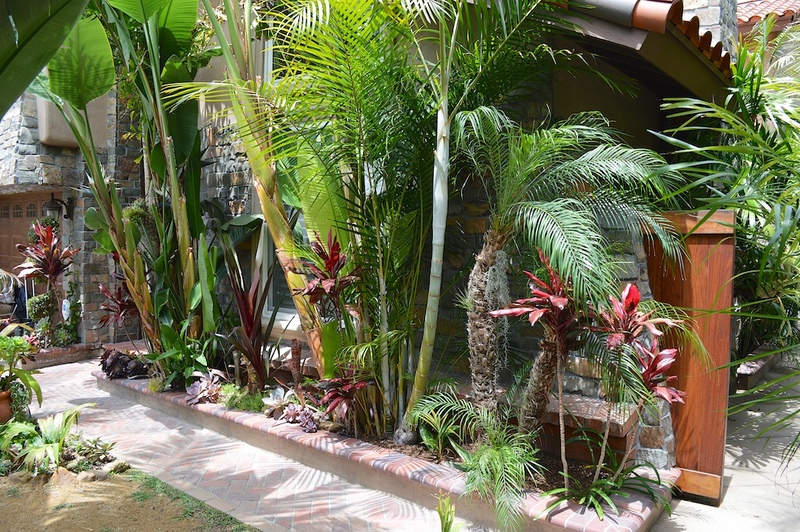 Their “jungle” is loaded with palms, cycads, succulents, ti plants, bamboo, bromeliads and various foliage plants to create that tropical feel. 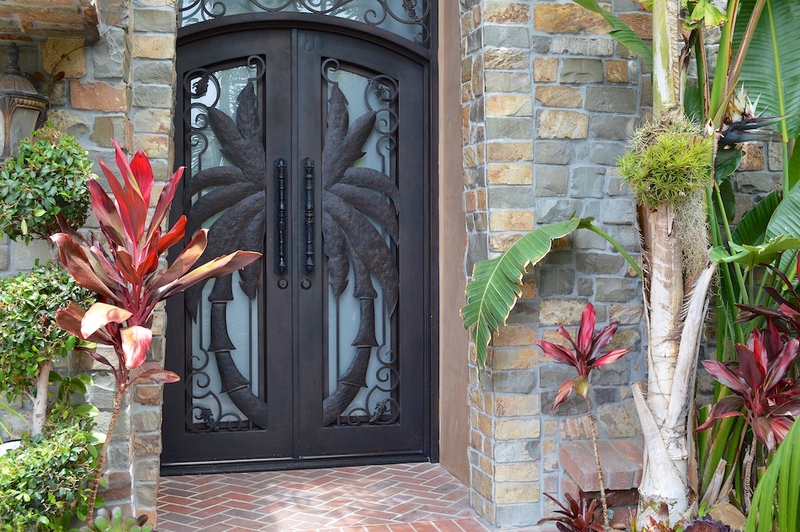 Even their front door represented their love for palm trees. In the Nesheiwat’s garden you could easily be tricked into thinking you were in some tropical location and not chilly, cloudy Southern California that day. 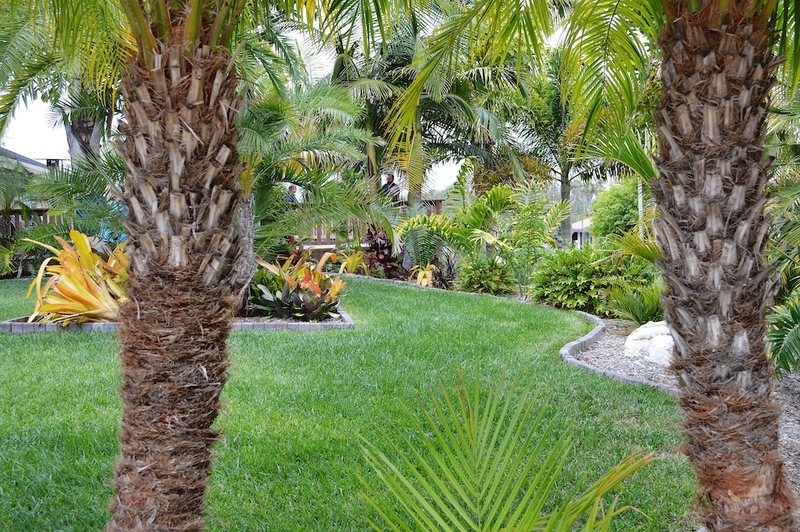 The last photo shows the side yard view looking towards the outdoor bar. 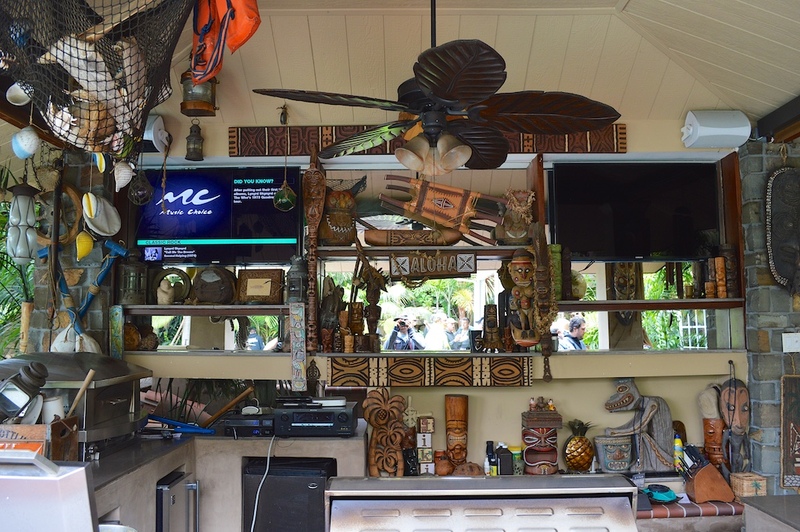 When you finally get to the outdoor bar and grill area you find a wonderfully eclectic collection of art. 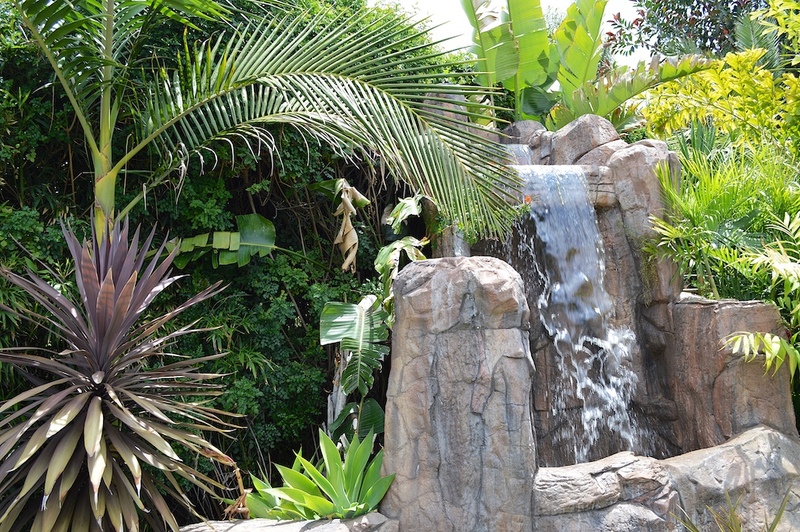 After you pass the waterfall in the backyard you would find a gate that leads to a path down their back slope. 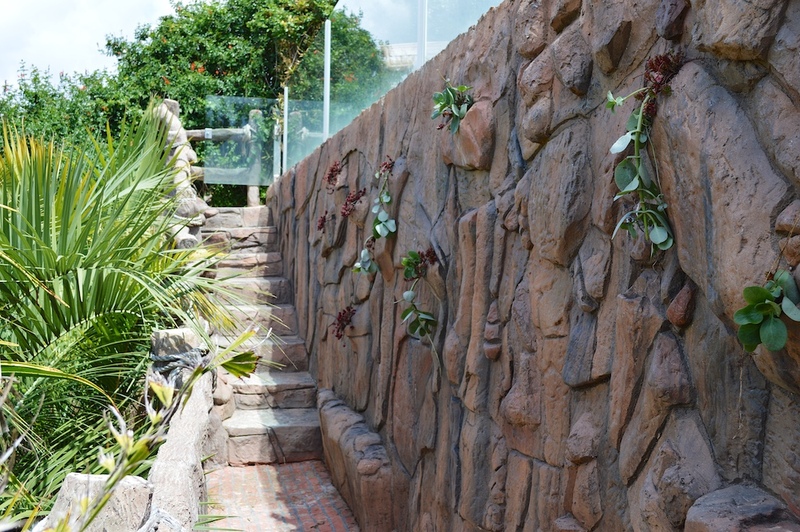 The retaining wall holding the backyard in place was not of your ordinary design. 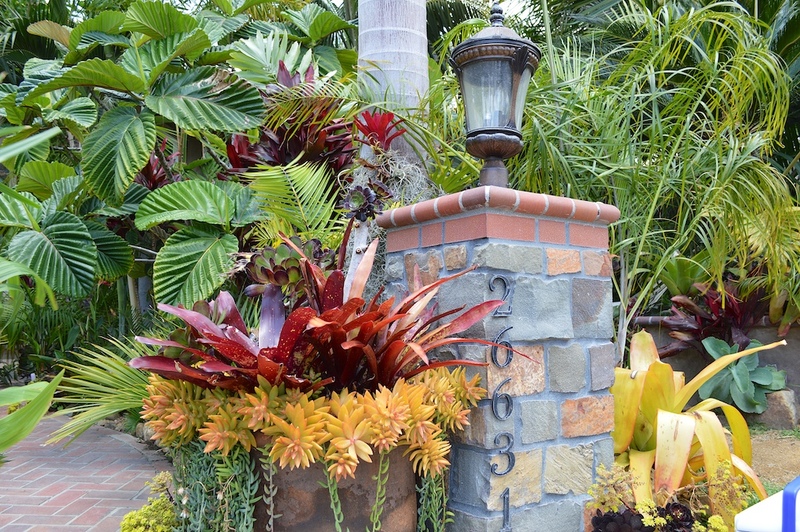 Disguised as a rock wall, it was crafted with planters that were used for various succulents, making what would usually be a boring wall a focal point. 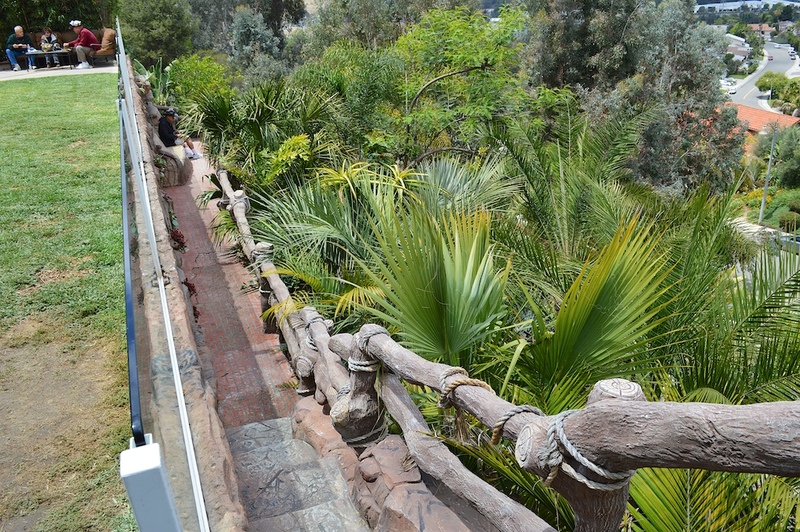 Jawad and Brooke took over their hillside and added a walkway down from the top of their yard. By talking over the hillside they were able to fully plant out their entire 20,000 sq. ft. lot. As is typical with any hilly terrain in Southern California, cold and frost will settle at the bottom. 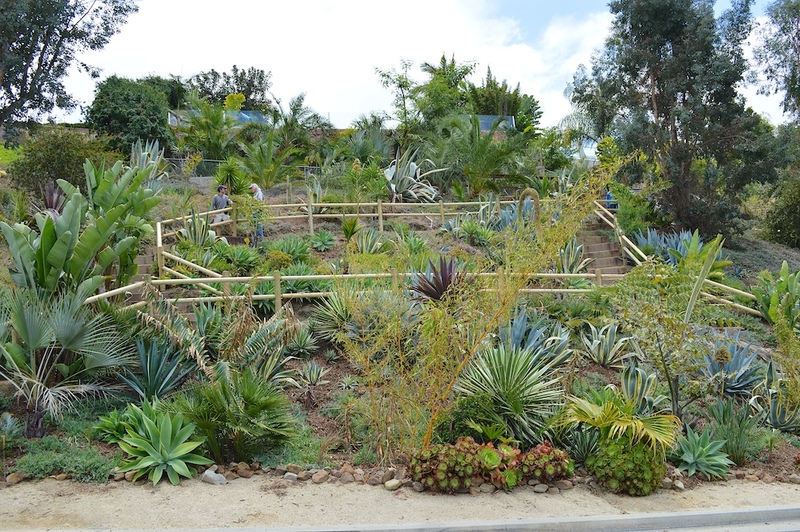 This is why they mostly planted agaves and other cold-hardier plants on the hillside and didn’t carry the tropical theme all the way down. 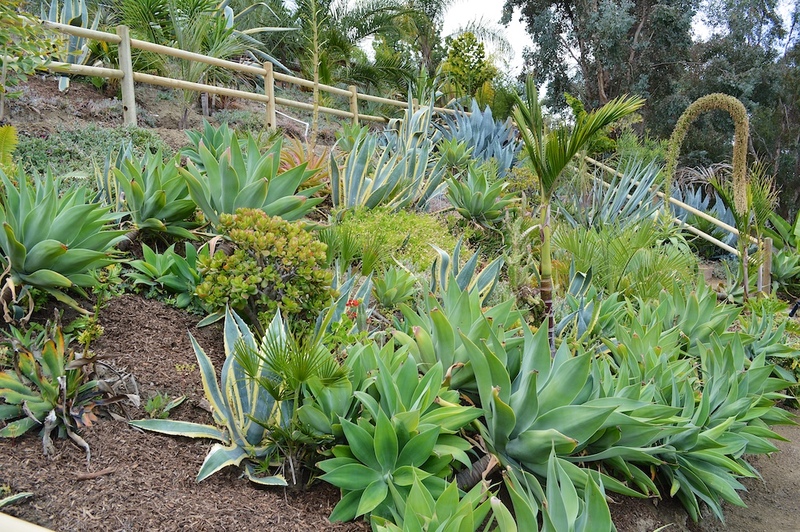 Plus, watering a tropical landscape on a hillside requires a lot of irrigation, which isn’t cheap while we battle through a drought. 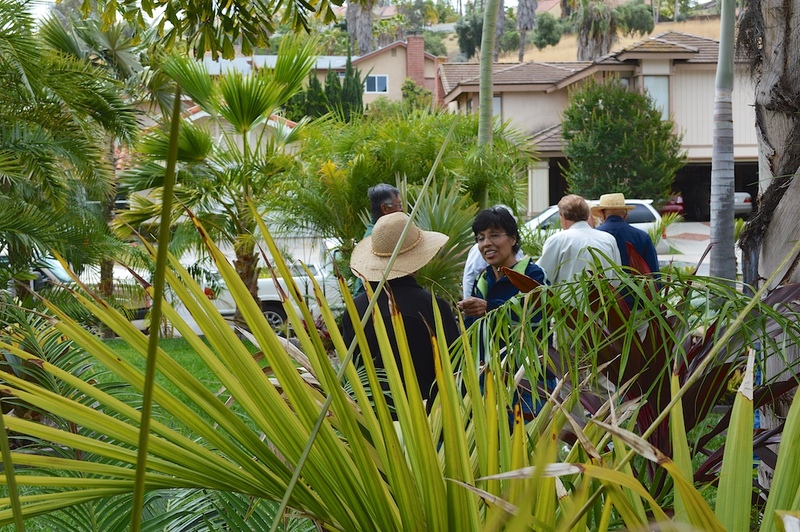 Moving back up to the top of the yard we can see that the Palm Society of Southern California’s potluck had begun. 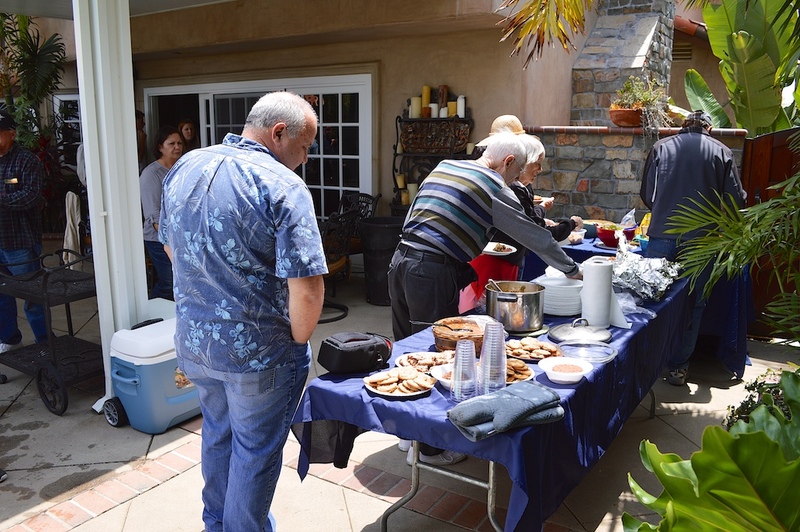 Each Palm Society meeting member brings a different dish to share. You can tell from the line the potluck is a popular tradition with these tours. Another popular tradition also serves as a very important component to the PSSC’s survivability. This component is the plant auction. 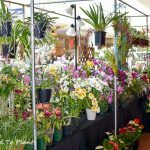 Each meeting, commercial nurserymen, backyard growers and simple gardeners like myself donate plants to be auctioned off. The money raised goes directly into the PSSC’s general fund and is used to help run this all -volunteer organization. I donated four plants and generated close to $200 for the PSSC. Every little bit counts. 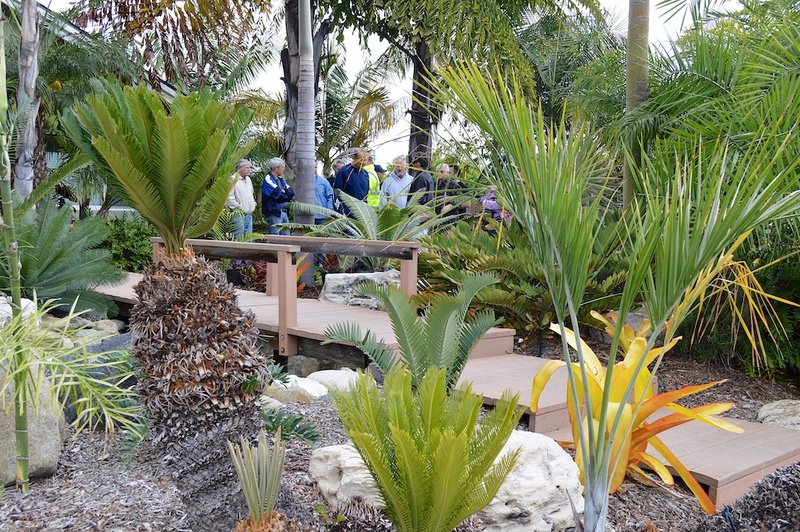 The chance to tour some of the finest palm gardens in Southern California is not the only member benefit of the PSSC. They also produce what I consider to be one of the nicest publications of any small volunteer plant society around. 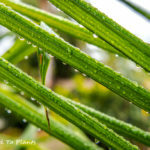 The Palm Journal is a full -color, easy-to-read publication that is written by hobbyists, for hobbyists, but also has articles written by world-renowned palm botanists. 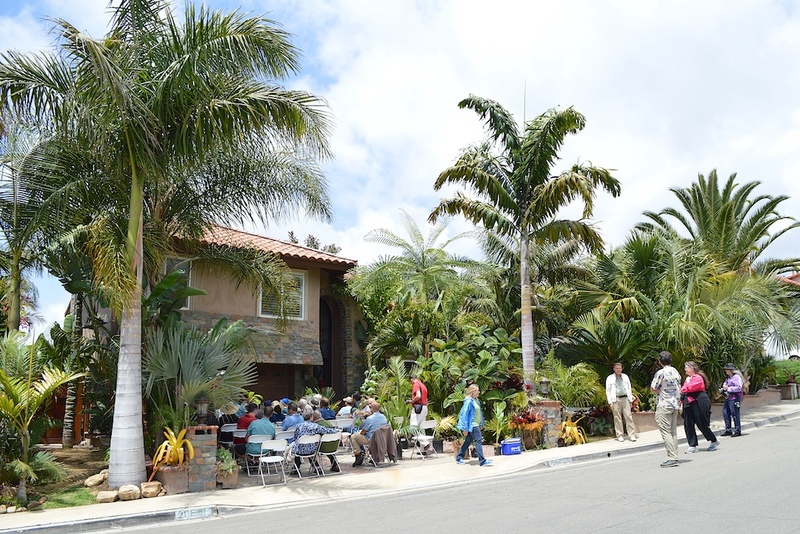 When you consider that you get a few journals each year and the opportunity to meet up with other palm tree admirers each quarter on garden tours, it’s really hard to believe the cost is only $40 a year to be a member. 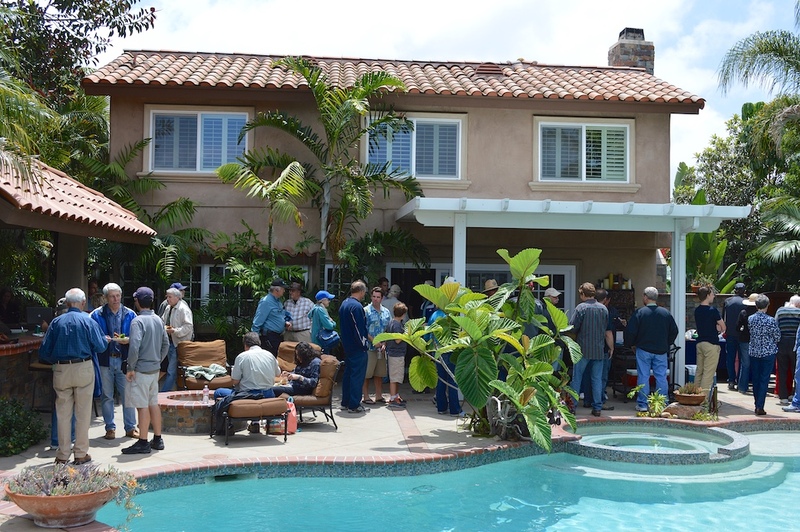 I would like to thank Jim Vargin and Jawad and Brooke Nesheiwat for their hospitality and for opening up their gardens for myself and other Palm Society of Southern California members to enjoy and admire.